A freckle-faced young dwarf maiden, Rhea stands barely four and a half feet tall but like many of her kin, she is strongly built. Her hands are calloused from working the forge since she was very young and Rhea's emerald colored eyes shine with wisdom and strength. A gruff, stoic, but generally pleasant individual, Rhea brightens a room as she enters with a kind smile, but says little unless spoken to, or has something of import to say. 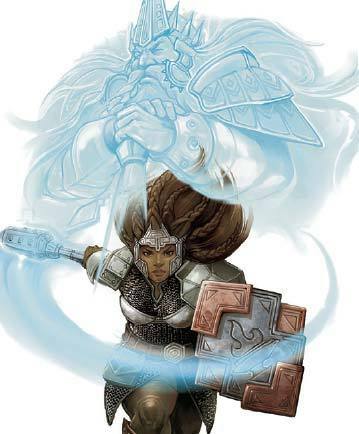 Know however, when she comes to do battle in the name of the Dwarf-Father, she becomes a bulwark of defense, wading through enemies and cutting them down as a harvester! Turn Check Data Not Listed, Will be used to fuel Divine Feats! Metal:Granted Power: You gain Martial Weapon Proficiency and Weapon Focus as bonus feats for either the light hammer or the warhammer (your choice). Wall of Iron: 30 hp/4 levels; can topple onto foes. Transmute Metal to Wood: Metal within 40' becomes wood. Aid: +1 on attack rolls, +1 on saves against fear, 1d8 temporary hp +1/level (max +10). Magic Circle against Evil: As protection spells, but 10' radius and 10 min./level. Holy Word: Kills, paralyzes, slows, or deafens nongood subjects. Summon Monster IX: Calls extraplanar creature to fight for you (Good only). War Granted Power: Free Martial Weapon Proficiency with deity’s favored weapon (if necessary) and Weapon Focus with the deity’s favored weapon. Replaces: If you select this option, you do not gain the ability to spontaneously convert prepared spells into cure or inflict spells. Benefit: You can convert stored spell energy into spells of one of your domains. Pick one of your two domains. You can lose any prepared spell (Other than domains spells) to cast any spell of equal or lower level on that domain list. Your choice is permanent unless you change alignment, change deity or some other dramatic event leaves you incapable of accessing the domain. In addition, when preparing spells you can choose to fill any or all of you domain spell slots with cure or inflict spells (Depending on whether you would normally convert prepared spell slots into cure or inflict spells) of the same level. War Domain Selected for this A.C.F. As the repository of a tiny fragment of a long-dead high priest of a particular deity, a reliquary holy symbol functions just like any other holy symbol. In addition, for each of the following prerequisites that you meet, the holy symbol grants you one additional daily use of your turn or rebuke undead ability. any cleric of Heironeous, or by any lawful good character. Potion of Barkskin, X2, 600 Gold. (Ohh, ohh…) Yeah, your time is done and now it's time to bleed. (Ohh, ohh…) And I will see you ride it straight to Hell. And I will see you ride it straight to Hell.